If you ever caught birds as a kid, you’ll recognize this set up. You would take a wooden box, put a stick under one side tied to a string, and then put bird seed under the box. You get the idea. 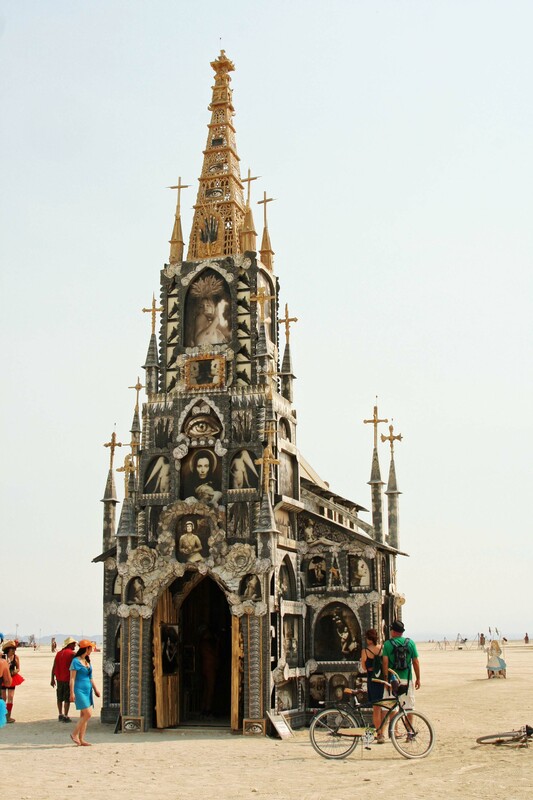 The name for this diabolical structure designed by Rebekah Waites was called Church Trap. I thought the outhouse was a clever addition. One summer when I was a child, my mother decided it was time my brother, sister and I got some old-time religion. So we were dressed up and dropped off at the Diamond Springs Community Church for Vacation Bible School. I must have been all of five years old. Marshall and Nancy were older. One day we were privileged to witness a true miracle in progress. Somehow we had escaped from Vacation Bible School only to be corralled into attending an actual kids’ service. I think it was a graduation ceremony meant to put the exclamation point on our lessons. It came complete with hymns, prayers, a sermon and lots of Amens. Then the big moment arrived. “Would you like to hear the Lord knocking at your heart?” the Minister asked. “Oh yeah!” “Wow!” “Really?” What little kid could resist? “None of you little kids open your eyes until I tell you to,” he ordered. Twenty little children dutifully bowed their heads and screwed their eyes shut. Three didn’t. If there was to be a miracle, the Mekemson kids wanted to see it. So we watched the preacher with eagle-eyed attention. 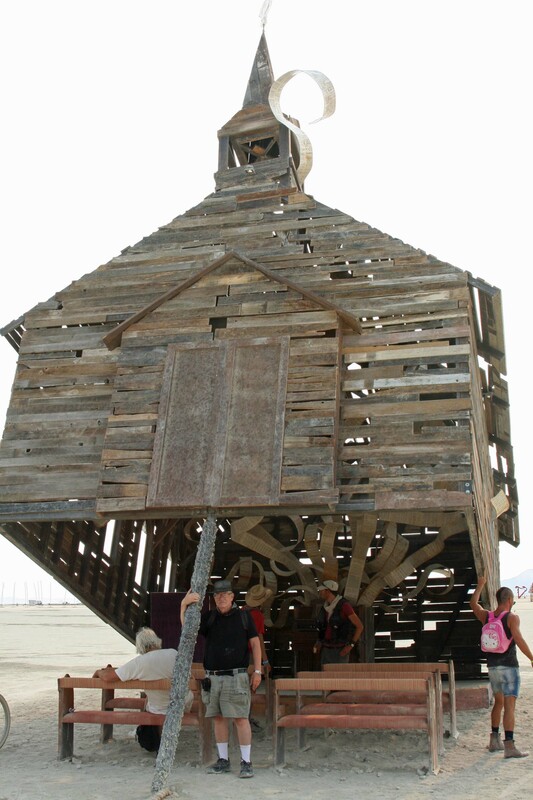 He tiptoed from the pulpit to the back of the church. Bang, bang, bang. He pounded on the back door. Yes indeed, the Lord does work in mysterious ways. We watched the minister tiptoe back to his pulpit. Twenty little sets of big round eyes popped open and twenty little mouths started gabbing all at once. 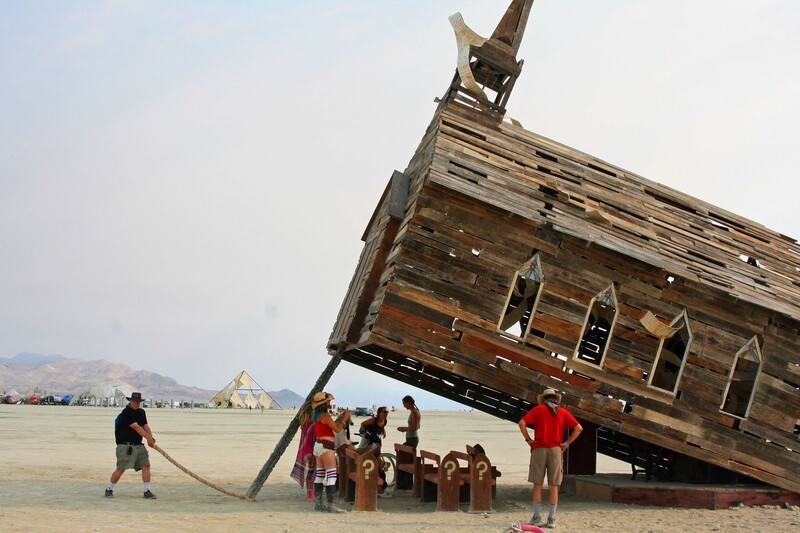 You could almost guarantee that the kids would be eager to come back to church. The minister smiled smugly until his eyes fell on us. We got the glare. He kept us afterwards for the lecture. Unless we changed our ways, we were bound for a very hot place. Inside, an organ filled the church with the music you saw escaping in the previous photo. Was music the birdseed designed to trap people? A view of the music filled church. Tom Lovering, AKA Adios, has been lured inside. 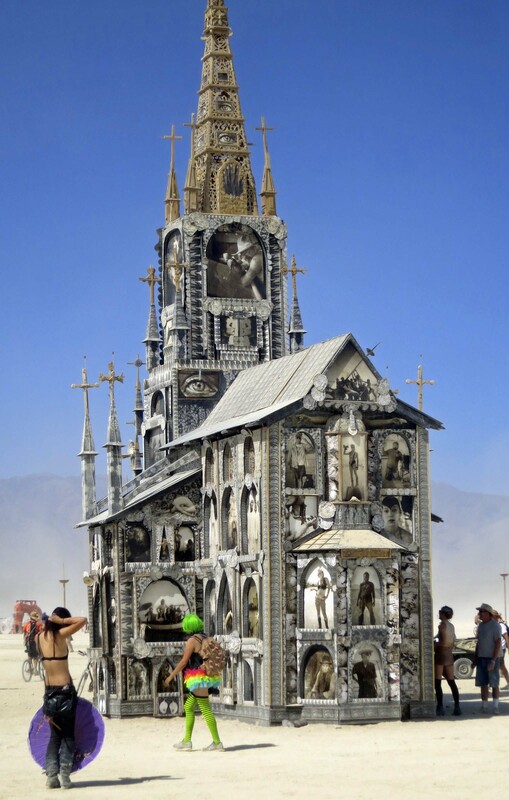 “It’s the biggest thing I have ever done,” Mike Garlington said of his Photo Chapel, a 40-foot tall cathedral where Mike featured his photographs of family, friends and fellow DPW (Burning Man’s Department of Public Works) volunteers. His contemporary work had a feeling of age, like photos that were taken in the late Nineteenth or early Twentieth Century. “I collect old photos and these are terrific,” a young woman standing next to me said. 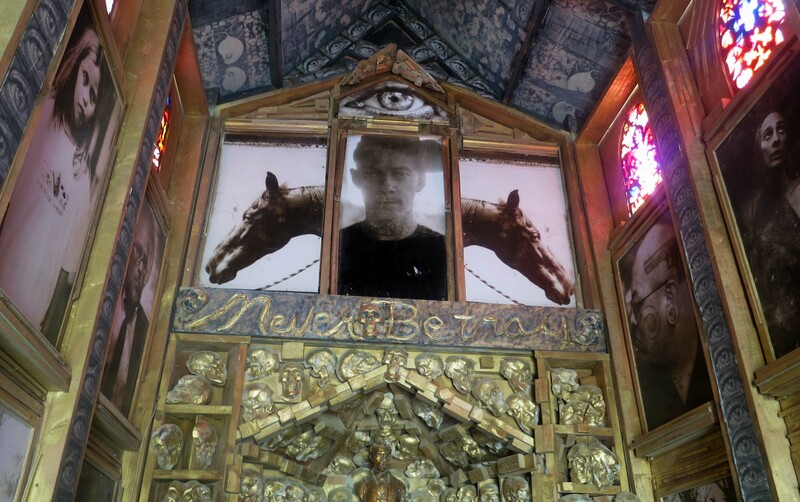 Like her, I had assumed the photos were taken from an earlier era until I saw Larry Harvey, the founder of Burning Man, staring out at me from one of them. 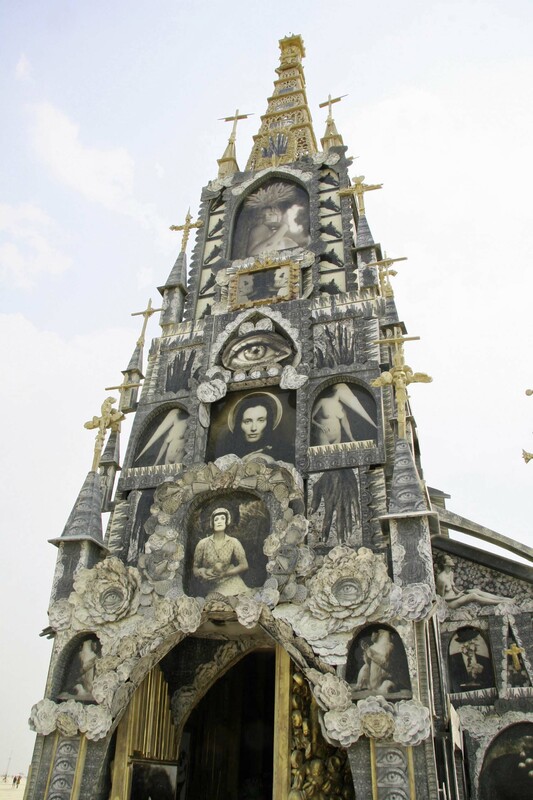 Mike Garlington’s Photo Chapel from the rear. 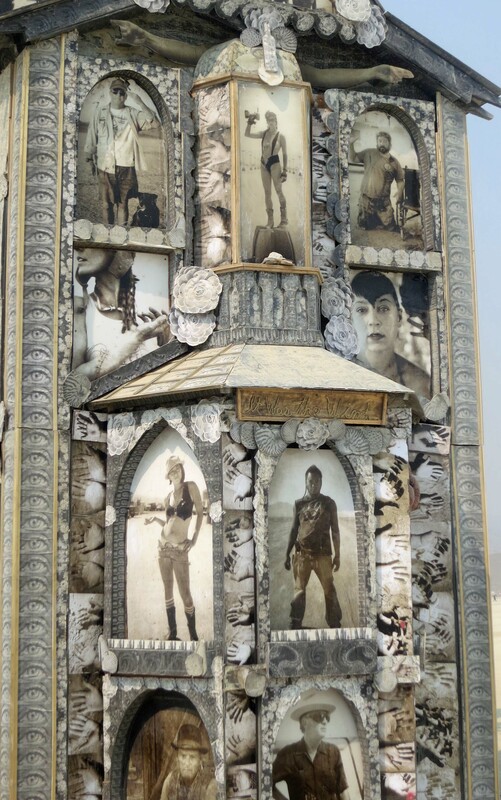 Larry Harvey is on the bottom right. 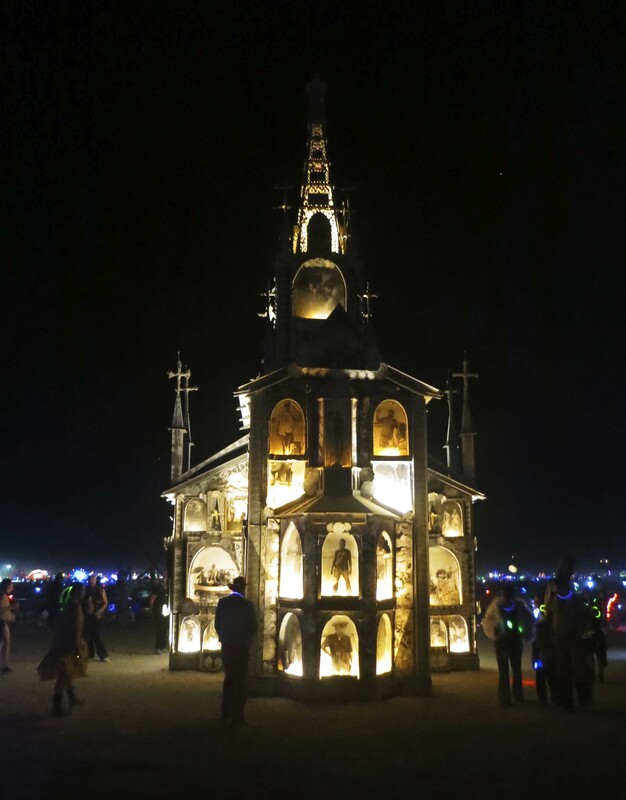 The back of the Photo Chapel at night with Larry Harvey at the bottom center. 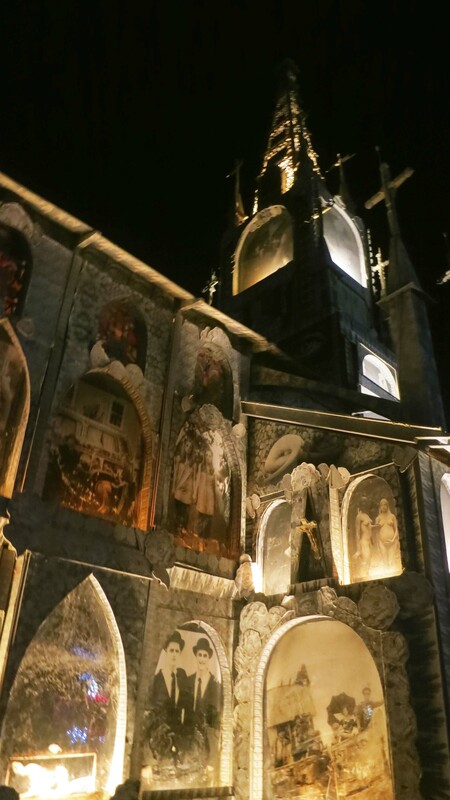 A side view of the Photo Chapel at night. 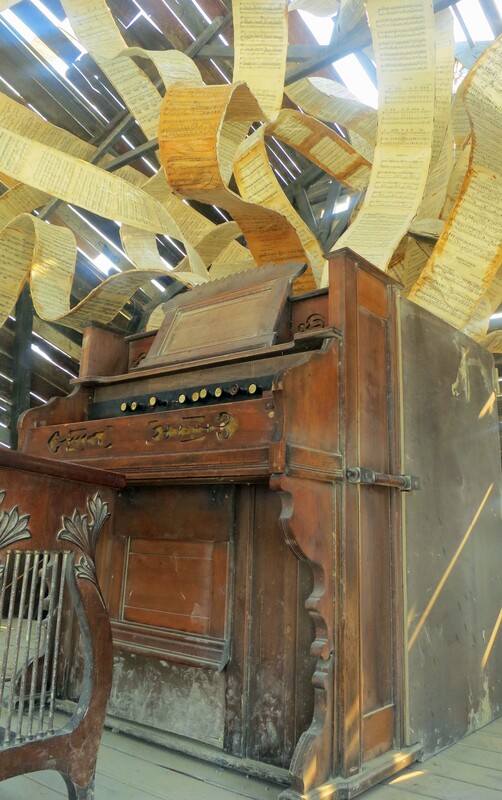 A view from inside the Photo Chapel. 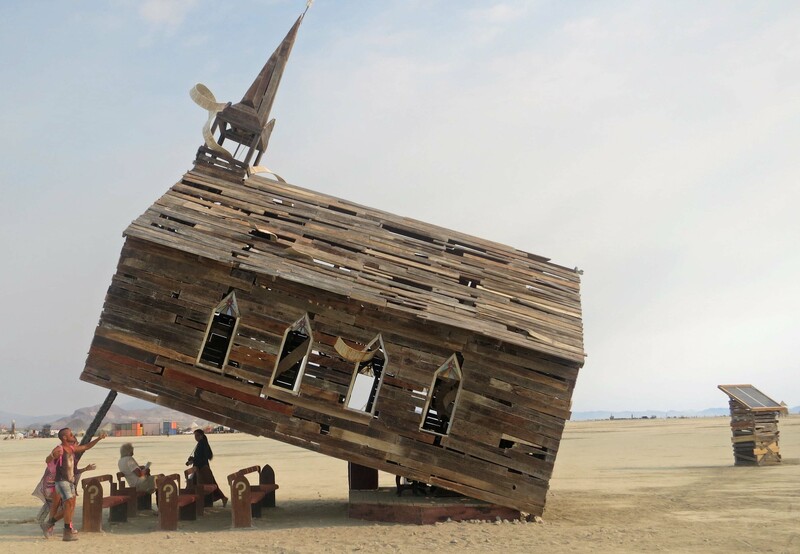 The person featured is Joey Jello, a member of Black Rock City’s Department of Public Works who died in an auto crash just before 2012 Burning Man. His motto, shown below the photo, was “Never Betray.” It referred to his core values. As for the horses, I don’t have a clue. A close up to provide a closer look at some of the photos. 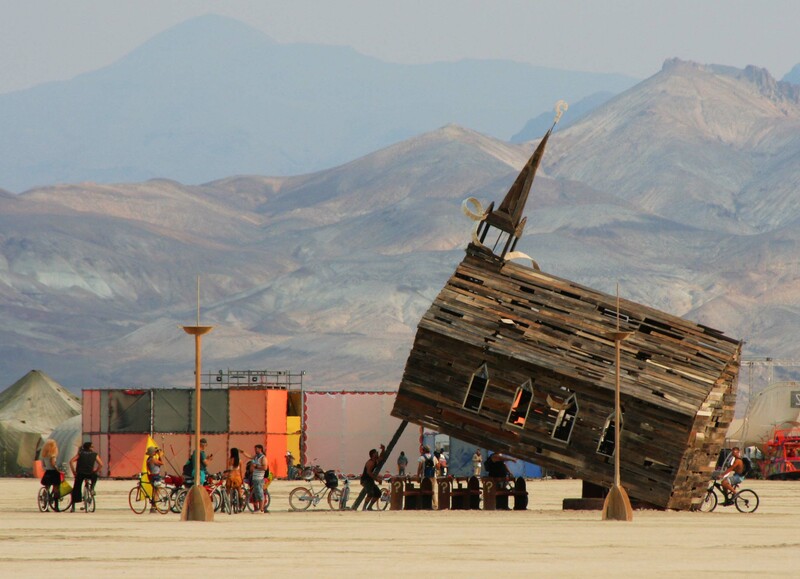 Mike Garlington, photographer and creator of the chapel is on the upper left. Larry Harvey on the lower right. 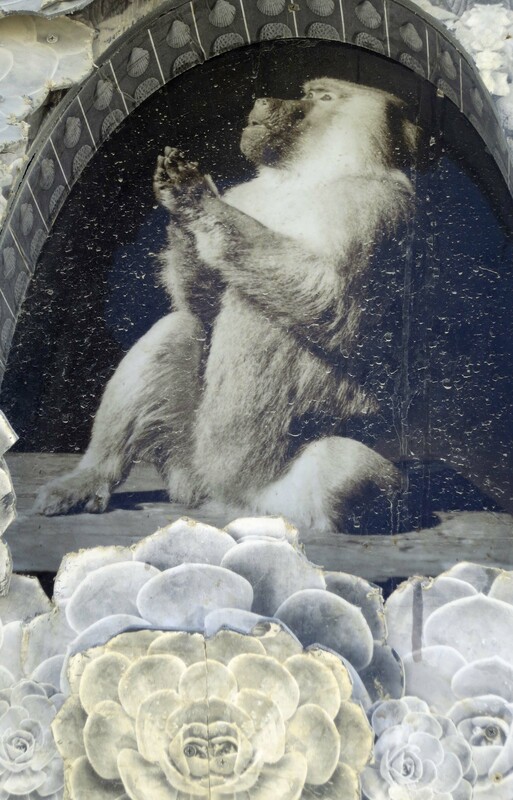 I’ll conclude with this chimp who appears to be praying. 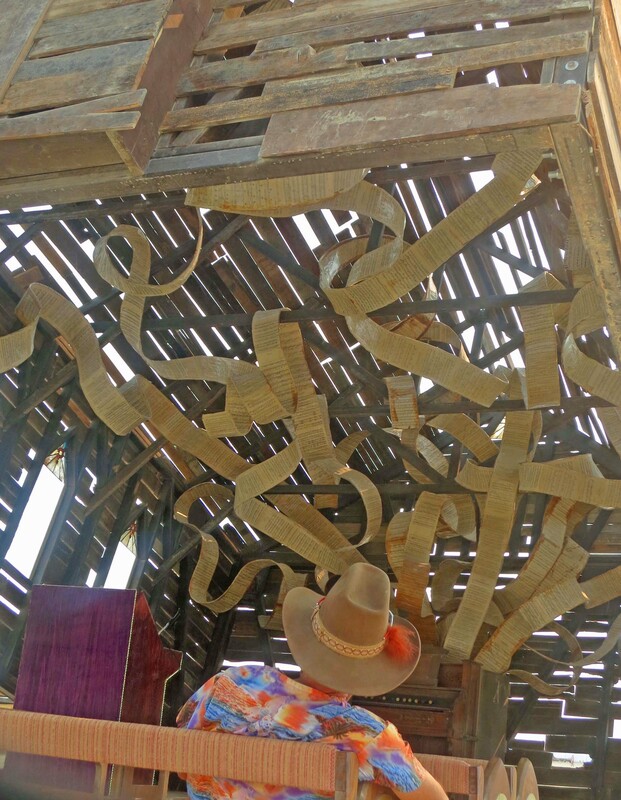 NEXT BLOG: A visit to Center Camp.